- Adjustable sanding arm pivots 100 degrees for hard to reach areas. - Electronic speed control dial for fine work. - Easily adjustable belt tracking with a turn of the knob. - Dust-free work with Makita dust collection system. 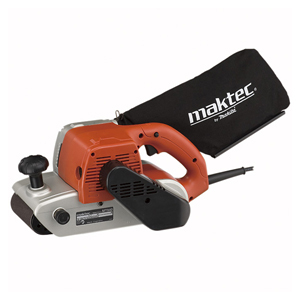 Perfect for flush-along-side sanding as well as open areas. - Highly-efficient dust collection system for clean work environment. Perfect for flush-along-side sandling as well as open areas. - 2-speed feature for variety of applications. 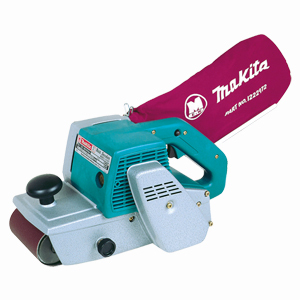 - 500 m/min belt speed for fast material removal. Compact and well balanced for easy operation. - Unique design allows flush sanding to a wall. - Low noise at only 82dB for quieter operation. - Net weight 2.7 kg. - Power supply cord 2.5 m.
- Extended base to allow flush sanding. - Replaceable ceramic wear-plate for easy maintenance. - Easy lever control to change belts. - Net weight 4.8 kg. - Power supply cord 5.0 m.